Double block & bleed valves are something of a speciality for Hobbs Valve. Double isolation in an integral cast? Check. Special face to face requirements? Check. Single actuation with linkage systems? Check. Bespoke bleed requirements (single, double etc)? Check. Hobbs Valve pride ourselves on our ability to design bespoke solutions to your specific needs. Our latest offering included solving a problem at a major Petrochemicals facility in the USA. 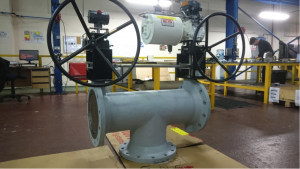 Our client initially made an enquiry for two 44” lugged valves, with the intention of fabricating a spool piece to create a double isolation package. Little did they know at this early stage our in-house design capabilities. After further correspondence on the detailed requirements, we came up with a bespoke solution to meet their needs. The client was facing a specific challenge on site and required a zero-leakage solution. With the space and piping restrictions; we came up with a special face to face package and designed a linkage system, to allow the use of a single actuator to operate both discs. Through our close partnership with our supply chain, we were able to work closely with the foundry to create a new pattern, to incorporate every request from the client; right down to the specific bleed requirements. Our standard double block & bleed product range covers valves from 2” to 24” ASME classes 150lb & 300lb However, no matter how large or complex your requirement is, Hobbs Valve can come up with the solution to your needs.